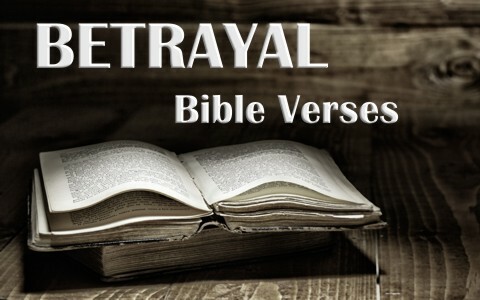 Here are ten important Bible verses about betrayal. This was right after Judas left the Passover meal when Satan entered Judas (Luke 22:3) and tragically, “He went away and conferred with the chief priests and officers how he might betray him to them. And they were glad, and agreed to give him money. So he consented and sought an opportunity to betray him to them in the absence of a crowd” (Luke 22:4-6). Sadly, he was more concerned with money than with the Messiah, Jesus Christ. If you’ve ever been betrayed before, you know it hurts. Jesus felt betrayed but not only by Judas, but He was forsaken by all of His disciples and His other followers at the cross. A few stayed but most ran because if they could be associated with Jesus, they might end up with the same fate, so Jesus knows what it feels like to be betrayed, even by His own people, the Jews. Jacob’s name essentially means “deceiver” and that is what he had been for much of his life. He was finally caught in his own game by Leah’s father who made him work another seven years for his wife Rachel, the one whom he really loved. When Stephen was giving a reason for the hope that was in him (Jesus Christ), he rebuked the Jewish religious leaders because they had murdered the Righteous One by betraying Him and consenting to His murder by an illegal and unjust trial and then delivering Jesus to the Roman authorities, even though Pontius Pilate said, “I find no fault in the man” (Luke 23:4). On the night of Jesus’ betrayal, He knew who it was that was going to betray Him and so Judas, having known this also, asked “Is it I, Rabbi?” and of course, Jesus said “You have said so.” Notice that Judas doesn’t call Jesus Master but “Rabbi” which is significantly lower than the status He held before God and before men. When David was trying to gather forces together after the demise of King Saul, he warned all of these men that to betray him would be like betraying God and that they would fall under the disciplining hand of God but none did, and David was able to finally sit on the throne of Israel. The fact that Jesus was betrayed is even mentioned by Paul during the Lord’s Supper or Communion because it was on the same night where Jesus and His disciples had the Passover Meal and Jesus’ establishing a new and better covenant knew that Judas slipped out and sold Him out for thirty pieces of silver, which was about the cost of a slave in that day. When Jesus warned the disciples about the one who would betray Him, He said “woe to that man by whom the Son of Man is betrayed” and it would have actually been better that he wouldn’t have been born because today Judas is in a place of weeping and gnashing of teeth…the place of eternal torment or as it said in the Book of Acts when they were finding a replacement for Judas, because “Judas turned aside to go to his own place” (Acts 1:25) and that place is hell. God hates pride because it destroys unity, it devalues others, it overestimates a person’s self-worth, and it causes people to betray one another. In this case, God sees a person who lies and sows discord in the church as one who is betraying Jesus Christ because He is the Head of the Church and whoever hurts the body of Christ, the church, does it to Jesus Himself, so persecuting believers, whether in the church or out, is just the same as persecuting Jesus (Acts 9:4). That is betraying Christ. Every one of us has probably been betrayed before. Maybe it was by a family member, a friend or a co-worker and honestly, we have probably betrayed others by our words. We can do this by breathing out lies against others and this “sows discord among brothers” (Prov 6:19) and that is a betrayal of God’s trust in us and we commit cosmic treason every time we lie. Next post: Why Did Jacob Wrestle With God In The Bible?